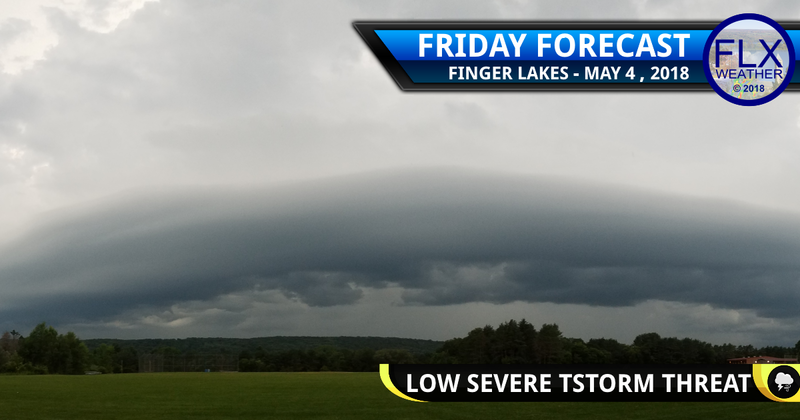 The Finger Lakes region should keep an eye to the sky this afternoon for the potential for strong to severe thunderstorms developing. Environmental conditions are more favorable for severe thunderstorms today compared to yesterday with strong wind fields aloft and an increase in moisture at the surface. NOON UPDATE: The Severe Threat looks legitimate for the late afternoon between 4 and 7pm. A squall line with damaging winds will be possible. I will have a new blog post for live updates starting between 3 and 4pm. However, the amount of instability in the atmosphere will again be uncertain. While the severe threat is a bit more robust than Thursday, plenty of uncertainty remains. Instability is a key ingredient that is necessary for thunderstorms to quickly develop and grow. Yesterday, the atmosphere generally remained stable and unfavorable for thunderstorm development. As a result, there was only one severe storm in our area between Elmira and Binghamton. Waves of energy in the atmosphere and an approaching cold front will possibly trigger lines of thunderstorms during the late afternoon and early evening. If the instability is robust enough, severe thunderstorms will be possible. Damaging winds will again be the primary threat. There is a small hail and tornado threat, mostly limited to any storm cells that remain isolated by themselves. The uncertainty this morning is still high enough that this event could go either way. 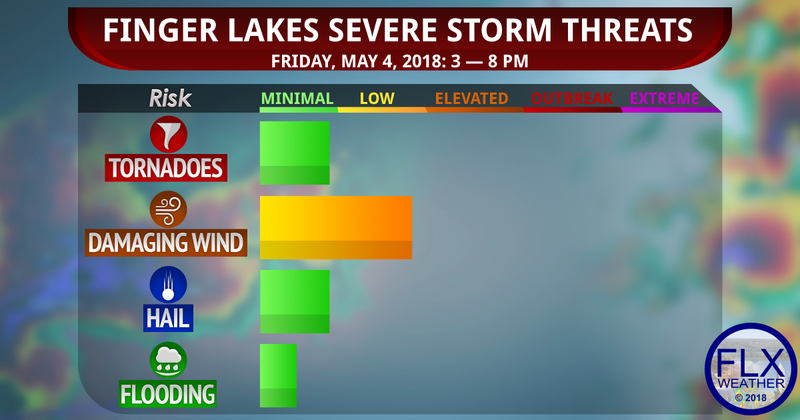 Numerous severe storms could be possible, or the threat could end up limited to a window of an hour or two over western New York just before the sun sets along the cold front. Beside the for thunderstorms today, there will be strong winds. Gusts over 30 mph will be possible during the day, increasing to 40+ mph overnight once the front passes by. Wind Advisories are in place for most of the Figner Lakes as a result. By Saturday morning, the winds should settle down and skies will turn sunny. Some high, thin clouds will work in later in the day, but no precipitation is expected. High temperatures will still reach the low 70s. Clouds will increase for Sunday, keeping temperatures in the mid and upper 60s. A couple afternoon showers will be possible. One or two rumbles of thunder are not out of the question. High pressure will build in for next week, keeping things dry until late in the week. Monday will be a bit cool with highs near or just below 60 degrees, but the rest of the week should be back into the 70s. 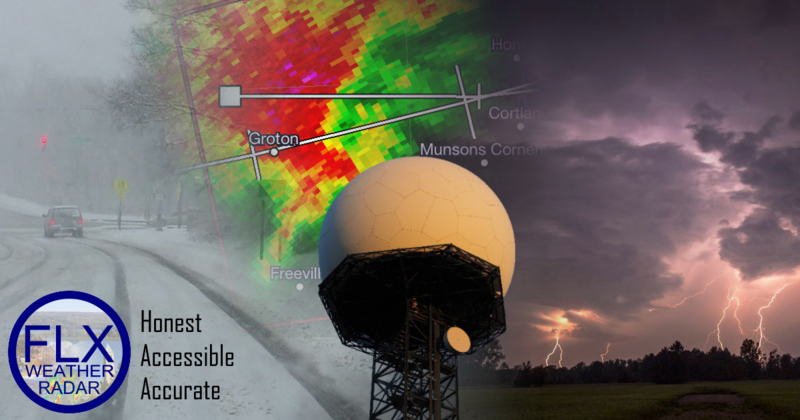 Check out the Radar page for up to the second information. Interactive and mobile friendly. Click the image above!